What's your worst-case scenario? Maybe you simply can't bear the thought of your Internet access getting cut (and by extension, your 24/7 stream of on-demand cat videos). Maybe you're actually on the run, leaving a trail of disposable prepaid cell phones and encrypted communications in your wake. Or maybe you've survived a war that makes Fallout look like a walk in the park, and you're holding the last bootable laptop on Earth. Well, don't just sit there and wait for it to happen--read on and prepare accordingly. If your government isn't yet on the verge of an Internet shutdown, your best defense to keep the Web running at your house is to do some preventive care for your Internet connection. Plenty of tools are available to let you browse the Web without Big Brother (or, more commonly, big-box stores) looking over your shoulder. The first and easiest tool to use is Tor, which employs a routing protocol that makes it easy to stay anonymous on the Internet. Tor sends your communications through other users' networks, allowing you to browse and chat in relative anonymity. Tor is already used by journalists, civil liberties groups, and even the U.S. Navy for anonymous communication, and it has even been helpful in the recent debacle in Egypt. If you're looking for something a bit more heavy-duty, Anonymizer is a software package that allows you to hide your IP address for about $80 a year. Anonymizer is a bit different from Tor, in that Tor hides your IP address through a distributed network, while Anonymizer has a dedicated server to help disguise that address, along with a Website that shows just how much information the address alone gives away. For extra credit: You can find plenty of tutorials around the Net that show you how to keep your privacy online, including articles on PCWorld.com. We've covered how to encrypt your Gmail, for instance. Also, check out this how-to from Instructables on blocking nosy RFID chips. As we've seen in the never-ending Wikileaks saga, a government doesn't need to completely shut off a country's Internet access to make life hard for a few troublemakers here and there. Luckily, a fair number of sympathetic services can can help you get back online. Bahnhof's Pionen Data Center (entrance)--click for full-size image. If you're looking to access the Internet across international lines, various satellite ISPs can help--and without messing with local Internet service providers. Satellite ISPs have downsides, however--the hardware isn't cheap (a low-end satellite modem can cost almost $3000), and while their services may be international, the ISPs themselves definitely are not--which means they could still fold to political pressure. Bahnhof's underground Pionen facility--click for full-size image. Finally, you may have plenty of reasons you'd want to eavesdrop on emergency radio communications--perhaps the authorities are about to sweep down on the protest site down the street, and you want to stay clear (or better yet, rush over there with a Flip camera). Try the Emergency Radio app (iPhone, $2.99) to stay on top of what's going on in your neighborhood--or, with hundreds of streams to choose from, in someone else's neighborhood. The entire body of human knowledge. Say what you will about Wikipedia as a research source--we still wouldn't want to go into a survival situation without a few copies of, well, everything humanity has ever known. You can download various chunks of Wikipedia from its Database Download page, ranging from the articles only (5GB or so compressed, 25GB uncompressed) to the all-pages, all-revisions archive (31GB compressed, 5TB uncompressed). Unless the world ends over a Wikipedia flame war, you're probably fine with the articles-only package. Just make sure you have the Edible Plants index page. 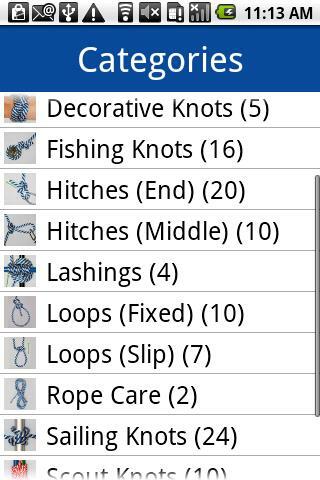 The Knot Guide Android app--click for full-size image. Survival tips. Do you remember your Boy Scout knots? When was the last time you trapped and killed your dinner? Stock up on survival apps like Knot Guide (Android) and the U.S. Army Survival Guide (Android). iOS users, on the other hand, might want to grab the $6.99 SAS Survival Guide and the $2.99 Hunting Call app. And if you ever need to ransack an abandoned pharmacy, grab the WebMD Medscape app before you start popping those diamond-shaped blue pills. Best of all, these don't require Internet access, so they'll be useful even after the end of the world as we know it. Finally, grab this Survival Communications FAQ to brush up on your radio skills. A MapDroyd screenshot--click for full-size image. Maps. Your GPS might still work after The Big One, but having it tell you to turn left on MacArthur and right on Telegraph doesn't help when both streets have been reduced to rubble. 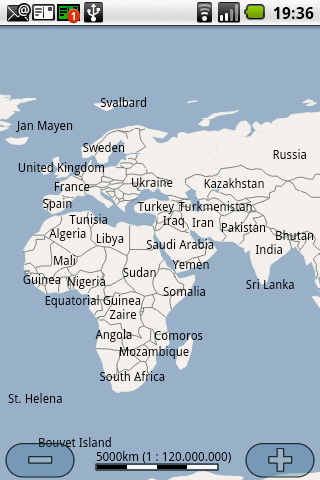 Grab a few mapping apps just in case--MapFinder lets you find topographic maps with the Google Earth plug-in and download them to your PC, while MapDroyd lets you save street maps onto your Android phone (which also can come in handy if you're traveling internationally and can't use your phone to connect to the Internet). A PC emergency kit. You're on your own when it comes to postapocalypse PC repairs. Fortunately, armed with your faithful back issues of PCWorld and a handful of emergency PC repair discs, you shouldn't have to worry about anything short of a hardware failure. What apps are you packing for the apocalypse? Post your tips in the comments! Patrick Miller might try out for the California SWAT team because a Facebook ad told him to. Follow him on Facebook and Twitter. David Daw is a PCWorld intern, and he's planning to download his favorite Tumblr blogs before the Internet goes down. Follow him on Twitter.